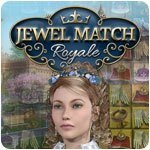 Jewel Match Royale Game Review - Download and Play Free Version! Choice of difficulty modes is very welcome. Each level is quite big. Bonus games won't be to everyone's taste. Jewel Match Royale tells the story of a young gardener who falls for a Princess, which leads to some awkward issues. Matthew, being far from noble, is told he can't take Princess Sofia's hand in marriage. Upset by such a possibility, he travels to far off lands to discover many precious gems to show his love and fortune to the noble family. The adventure doesn't stop there though, as he finds himself having to combine these gems in order to rebuild royal property and become a Duke. Only then will the Queen consider him good enough to marry her daughter. As part of such an eventful Match-3 game, you'll find yourself dealing with a plentiful supply of challenges along the way. Choose from 3 different play modes - timed, relaxed, and limited moves. Tackle 120 substantial levels of matching gem goodness. Participate in one of many different bonus games, including Mahjong. Jewel Match Royale isn't just about matching gems either. You can also spend time rebuilding your castle through a series of specific tasks and requirements. Unlock new and special decorations for your castle. Restore the Kingdom to its original wonder. Buy unique power-ups in the Shop, leading to better success in the game. Enjoy an appealing yet soothing soundtrack. Jewel Match Royale will instantly appeal to fans of Match-3 games being familiar yet offering them a new challenge to sink their teeth into. Just remember - your mission is to help Matthew marry his beloved Sofia! 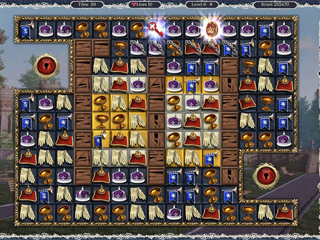 On the surface, Jewel Match Royale might seem like a very typical Match-3 game, but it's actually a story of lost love. Matthew is the son of the royal gardener, and he's fallen in love with Princess Sofia, heir to the throne of Neirinia. Despite spending time acquiring wealth, Matthew is still not deemed good enough by Queen Meredith, leaving him to have to attempt to restore the kingdom's many abandoned castles and estates. This is where you come in - helping him match gems and tiles in a bid to restore them to their former glory. It's a simple tale but a reasonably enticing one, backed up with many great Match-3 levels. Action is done in a familiar fashion to anyone who's played a Match-3 game before. Each level involves a screen filled with icons of varying different types and ilk. You have to swap them with an adjacent tile in a bid to match them together. Match three or more, and the pieces vanish, leaving tiles above them to fill in the gaps you've created. It's a simple concept but a satisfying one. Not least when you set up a series of combos and wipe out lots of the board in one go. In Jewel Match Royale, you have to match tiles that are located on gold squares. Wipe out all the gold squares, and you move onto the next section. Frequently, levels are made up of a number of different screens meaning there's quite a lot to do. Not all tiles are the same either, with some requiring extra interaction. They might have chains blocking them or be covered by ice. Each issue requires a different approach, such as chained tiles needing to be matched to remove the chain. Others might need to have a match made next to them. It's all suitably logical yet satisfying to figure out. A choice of difficulty levels ensures you won't ever be too challenged though. Those who want to be speedy with their progression can choose to go with a Timed Mode, working on being as fast as possible. A more puzzle orientated mode comes in the form of Limited Moves Mode, while Relaxed Mode is ideal for those who simply want to take their time playing. That flexibility is ideal for more casual players. Jewel Match Royale isn't just about matching tiles either. 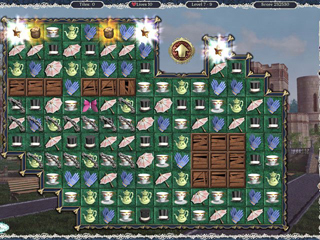 Action is broken up by mini-games such as Mahjong, giving you a nice variety of different casual gaming elements. Mahjong won't be to everyone's liking, but it does ensure that the matching side of Jewel Match Royale never feels too overdone. There's always something else to do. You also spend some time using the money you gain from levels to rebuild Matthew's castles and keeps. It's fairly limited in scope, simply requiring you to make a couple of choices, but it gives you a sense of progression and achievement nonetheless. The only thing about Jewel Match Royale that isn't so appealing is its visuals. It's all rather bland and unremarkable. Its musical score might be reasonably serene but it soon turns a bit dull. Accruing a combo and watching the board clear is immensely satisfying, but Jewel Match Royale is never particularly nice to look at. It looks rather dated. Jewel Match Royale might look a bit dated but it packs a punch where it counts. It's a fun and vibrant Match-3 game, giving you plenty of potential for enjoyment. Its wealth of challenging levels rarely feel samey, thanks to there always being a new thing to consider. Being able to change modes according to whether you want a speedy experience or a very tactical one is a great move in keeping you interested. The storyline, though simple, is quite charming and keeps you reasonably engrossed. While the bonus games might play things a little safe and unremarkable, it's mostly highly enjoyable. There's enough going on that you'll always feel there's something to work towards to. It's a great example of the genre and sure to entice you into playing more of the Jewel Match series.